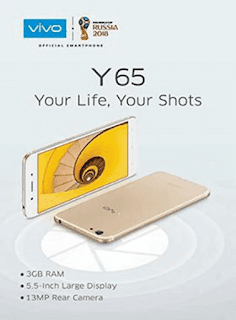 Vivo has launched yet another device called Vivo Y65 with cool specifications and features. The phone spots a 5.5-inches screen display, 4G LTE enabled, runs on Android 7.1 Nougat straight from the box which is powered by Snapdragon 425 processor. Vivo has tagged this phone "your life, your shots". The phone carries a 3GB RAM plus 16GB Internal storage and a 3000mAh battery capacity to keep the phone running. It's a nice phone with moderate features, not bad.